However, it is possible to get to the common/conventional/standard periodic table directly from two readily available data-sets: (1) first ionisation energy of the gas phase atoms, and (2) atomic radius. The procedure involved plotting the data, rotating 90°, squeezing vertically and smoothing. The points need a little tidying up, and then they can be mapped directly onto the Seaborg formulation periodic table. The only element which does no obviously 'line-up' with the periodic table is hydrogen, but many modern periodic tables have H floating as it is not obvious if it should be considered to be a Group 1 alkali metal or a Group 17 halogen. There are advantages and disadvantages to each data set. The 1st ionisation energy data from NIST is known with up to seven significant figures of precision, but the data jumps about at times due to the presence of the s & p-orbitals, which appears to make the data a little noisy. (Actually, this 'noise' is embedded information about the electronic structure of the atoms.) 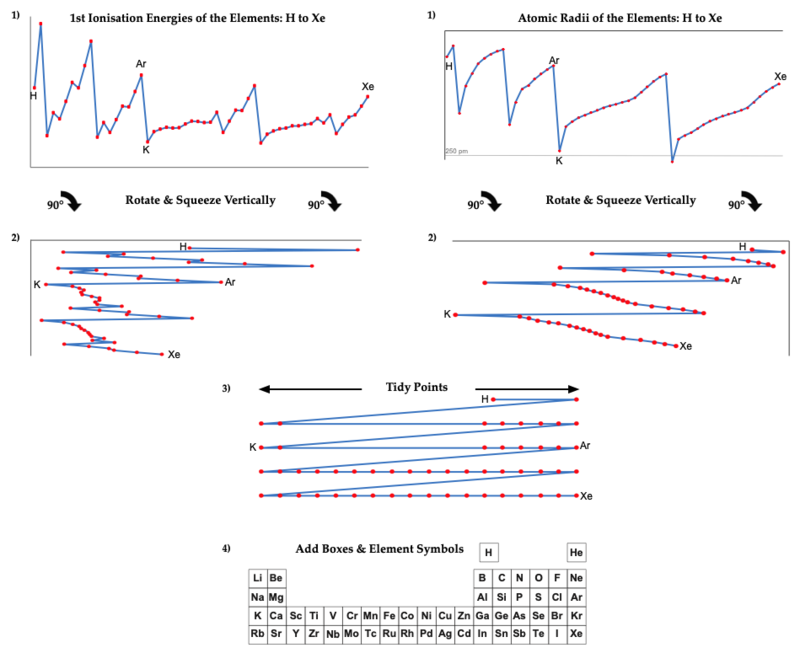 The atomic radius gives smoother data, but as gas phase atoms do not have hard edges calculated (Clementi 1967) rather than experimental values, must be used.